Reusable bags are everywhere these days. While I applaud the effort to get the average American consumer to think about the environment and our impact on it, I must admit that most reusable bags aren't really attractive enough to haul around all the time. Sounds insipid, but I for one would be way more likely to keep these bags at the ready if they were…cute. Heeding my call is Neela, a new woman-owned company that recognizes the need for pretty AND practical. Neela offers bags that are reusable (for up to two years with regular use) and recyclable (#5 plastic) in lovely patterns that guarantee you will actually want to use them. 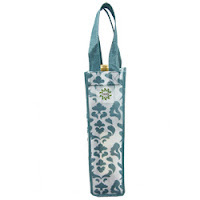 They are hand-washable and can carry as much as three standard plastic grocery bags! Most styles also feature shoulder length straps, which make them much easier to carry than traditional shopping bags, in my opinion. As an added bonus, most Neela styles retail for less than $10. 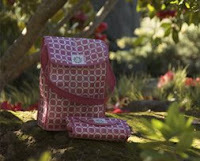 There are quite a few different styles of Neela bags available and most fold down for convenience. The Fold-Up Market Tote is my personal favorite. A go-to size (slightly bigger than a standard paper grocery bag) that folds down to a dainty clutch size and retails for a very affordable $5. 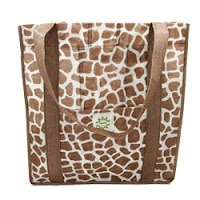 You can also get a set of five bags in their own carrier, The Market Pack, for $22, which I highly recommend. It is gorgeous and so handy! The whole case is only a bit larger than a diaper changing pouch, so it's easy to keep in the car or stroller and remember to take into the store. In my case, that's half the battle. Neela is a new company and promises to keep introducing eco-friendly, style-conscious goods regularly. I am so curious to see what they will come up with next. I'm in love with your blog!! I could spend all day clicking links to all the extra cool stuff you have on here! !